Author(s): Alexander N. Kharlamov. De Haar Research Foundation, Handelsplein 15, Rotterdam 3071PR, The Netherlands. 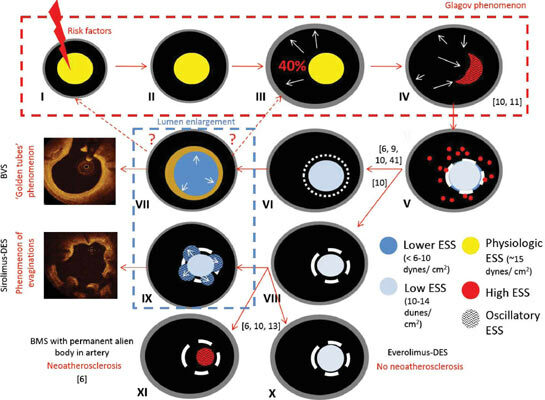 This review focuses on the clinical and biological features of the bioresorbable scaffolds in interventional cardiology highlighting scientific achievements and challenges of the transient scaffolding with Absorb BVS. Special attention is granted to the vascular biology pathways which, involved in the resorption of scaffold, artery remodeling and mechanisms of Glagovian atheroregression setting the stage for subsequent clinical applications. Twenty five years ago Glagov described the phenomenon of limited external elastic membrane enlargement in response to an increase in plaque burden. We believe this threshold becomes the target for development of strategies that reverse atherosclerosis, and particularly transient scaffolding has a potential to be a tool to ultimately conquer atherosclerosis. Keywords: Artery remodeling, atheroregression, bioresorption, bioresorbable scaffold, glagov phenomenon, stenting. Affiliation:De Haar Research Foundation, Handelsplein 15, Rotterdam 3071PR, The Netherlands. Keywords:Artery remodeling, atheroregression, bioresorption, bioresorbable scaffold, glagov phenomenon, stenting. Abstract:This review focuses on the clinical and biological features of the bioresorbable scaffolds in interventional cardiology highlighting scientific achievements and challenges of the transient scaffolding with Absorb BVS. Special attention is granted to the vascular biology pathways which, involved in the resorption of scaffold, artery remodeling and mechanisms of Glagovian atheroregression setting the stage for subsequent clinical applications. Twenty five years ago Glagov described the phenomenon of limited external elastic membrane enlargement in response to an increase in plaque burden. We believe this threshold becomes the target for development of strategies that reverse atherosclerosis, and particularly transient scaffolding has a potential to be a tool to ultimately conquer atherosclerosis.